If you have a bad tooth, one that forces you to make constant trips to the dentist, you are likely searching for a long-term solution to free you from discomfort, embarrassment, and hassle. A bad tooth can quickly lead to an extraction leaving you with a gap in your smile along with the frustration of a missing tooth. One of the most effective ways to solve this problem is by replacing a bad tooth with a high quality dental implant. Gum disease, dental decay and more can cause significant and irreparable damage to a tooth, but fortunately dental implants are available to give you the best solution. Dental implants provide a permanent, long-lasting alternative that offer unique advantages over their traditional counterparts such as bridges or dentures. A dental implant is a custom made crown that is designed to look and function like natural teeth. For dental implants, porous metal anchor is first placed entirely into the jawbone and then left to allow bone growth around it to lock it into place. After the anchor has become fully integrated within the jawbone, a mounting post is secured into it and the crown is then attached to the post and positioned at the gum line. Look And Feel Natural: implants are custom-made to fit in with surrounding teeth from size to color. This is particularly beneficial for people who only need to replace one tooth. Implants are not only designed to match your existing teeth, but they also function like natural teeth. Unlike dentures, implants are not taken out and will not move while you eat or talk. They are secured into the jawbone allowing them to provide the same feel as a natural tooth. Are Comfortable: Unlike dentures, implants do not require adhesives to hold it in place. Dental implants are tightly attached and provide a natural level of comfort while chewing or speaking. Implants will not become loose if you eat certain foods, they will not move and cause friction, and they will not slip. The process for a dental implant procedure may be longer and may cause discomfort as healing and osseointegration occur, but the results are comfortable and durable. 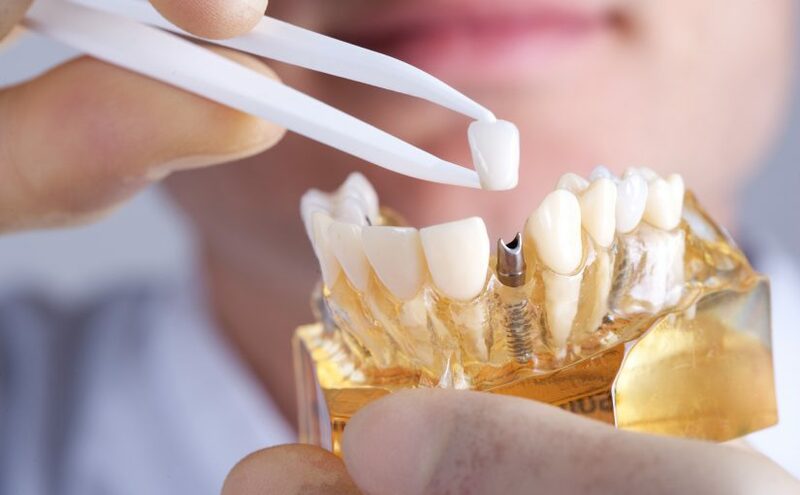 Won’t Damage Surrounding Teeth: Turning to a dental bridge to solve your dental problems will require the use of healthy teeth to secure the bridge. This can put strain on those teeth or even cause damage. A dental implant will not affect surrounding teeth, but it can prevent you from experiencing more problems. Are Long-Lasting: A dental implant is a permanent solution for bad or missing teeth. By carefully caring for your implant(s) just as you would your natural teeth, you can enjoy a dental solution that will last a lifetime. Implants cost more than a bridge or crown, but the long-term results can save you even more in terms of time, money, pain, and frustration. At Foutz Family Dentistry, we offer high quality dental implants that will provide you with the most effective solution for a bad tooth. Call our office today at (702) 792-5929 for more information on Henderson dental implants or to schedule a consultation.